This is a great time to be selling a house—or buying one. With housing prices at recent highs (in some neighborhoods they’re exceeding pre-2008 valuations), it’s no wonder about 5.3 million homes are expected to change hands in 2015, up about 30 percent from the bottom of the crash, according to the National Association of Realtors. Buyers as well as sellers can benefit. That’s because purchasing a home is comparatively cheap right now, thanks to still-low interest rates (they recently dipped below 4 percent for a 30-year fixed mortgage). “A home buyer with the U.S. median income who buys the median-priced home will pay 15.3 percent of their income on their mortgage now,” says Skylar Olsen, a senior economist at Zillow, the online real estate marketplace. “The historical number is 22.1 percent.” And although home prices will continue to climb in 2015, they’re expected to do so at a slower rate than in 2014. So how do you make the most money, no matter which end of the transaction you’re on? For answers, the Consumer Reports National Research Center turned to the people most in the know for answers—the real estate professionals who broker almost 90 percent of residential sales. A panel of 303 pros from around the country (covering markets big and small, hot and cold, city and suburban) completed our recent online survey, filled with essential questions: What are the costliest mistakes sellers make? When is the best time to put a home on the market? How negotiable are broker’s fees, really? The answers may surprise you. If you’re a seller, advice from the pros on smart presale fix-ups, coupled with our expert product ratings and tips, can help you get the best sales price for your home—an additional 12 percent, on average. With median single-family home prices hovering at about $205,000, that’s a potential gain of $24,600. In pricier markets, the profits will go many times higher. And both buyers and sellers can come out ahead with our guide to savvy financial and negotiating moves. Avoid the most typical mistakes and you could gain 11 to 20 percent, and even more in some markets, of the home sale’s price. April through June is prime home-selling season. So let’s get started! Nothing drives away would-be buyers faster than clut­ter, grime, and the weird smells that accompany a messy home. Bruce Irving, a renovation consultant and real estate agent based in Cambridge, Mass., tells clients to imagine their boss is coming to dinner with his or her spouse. “Your home should be at least that nice on the day of any open house,” he says. Vital to the process is de-cluttering and depersonalizing the space as much as possible. Buyers will have a hard time imagining themselves in your home if it’s filled with family photos and other personal effects. For severely cluttered residences, or if you’re downsizing and need help winnowing your possessions, consider hiring a professional organizer. Check the location-based member directory on the website of the National Association of Professional Organizers. “We’re not counselors, but we have skills to help people think through why they’re having trouble letting go of certain items,” says Jennifer Lava, president of the Austin, Texas, chapter. In addition to making your current home more sellable, a pro can help you get off to an organized start in your new residence. Depending on the level of clutter, an organizer may need one to three months to get your home ready for sale, at a cost of $600 to $2,500—money well spent if it helps your property move more quickly. The service might even be worth it if you plan to stay put for the time being because living in a cluttered home takes a psychological toll. Before hosting the open house, remember to open the curtains and blinds because natural light is just as important as order to making a home feel bigger. And give the entire interior a thorough cleaning, including vacuuming, dusting, and wiping down every surface. Your boss might not be coming over, but someone in the position to write you a very big check hopefully is. *Potential increase in asking price, assuming home value of $205,000. Click on the image for kitchen upgrades. It’s a real estate adage that the kitchen, more than any other room, sells the home. In fact, 53 percent of real estate professionals told us that the kitchen is among the most important rooms of the home to have in good shape before selling. But that doesn’t mean you should drop tens of thousands of dollars on a new one before putting your house on the block. “Given all the volatility in the real estate market, you can’t spend megabucks on any project, even a kitchen, and expect to get that money back,” says Bill Wilson, a real estate professional in upstate New York. His first advice to clients is to make all of those minor repairs that can lead to serious second thoughts for buyers—the leaky faucet, the loose light fixture, the burn mark on the countertop. Once you’ve made the kitchen fully functional, think about a gentle spruce-up. For a few hundred dollars, you can probably paint the walls, update the cabinet hardware, and add new curtains, which will give the space a clean, fresh look. 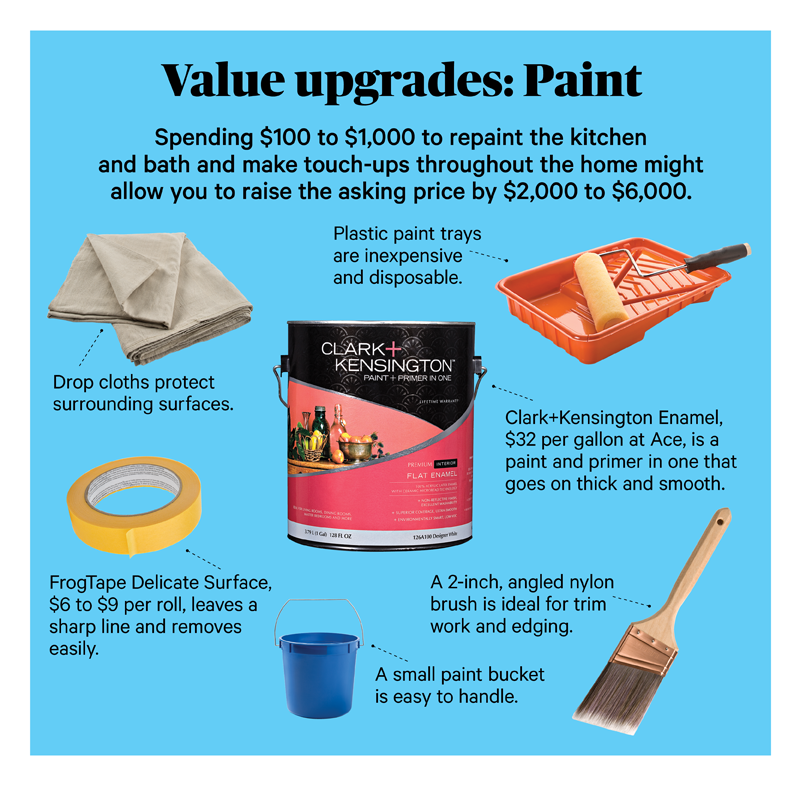 If the kitchen is badly outdated, increasing your bud­get to $5,000 might make sense, especially if you could be in the home for a few more years. 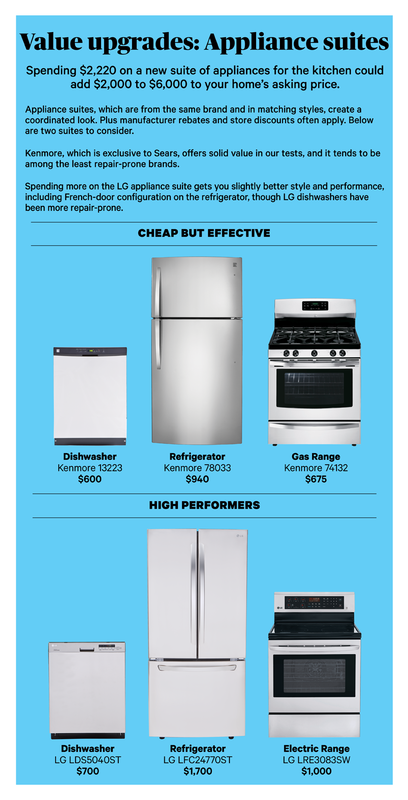 A couple thousand dollars will get you a top-performing refrigerator, range, and dishwasher, all with popular stainless-steel finish. New countertops and floors will cost about the same, especially if you go for DIY-friendly laminate and vinyl, both of which proved very hard-wearing in our countertop reviews and flooring tests. That will leave about $1,000 for odds and ends, such as light fixtures and a new faucet, as well as any necessary labor costs. Click on the image for bathroom updates. Buyers want to see that a home is clean and well-maintained, especially in the bathrooms. “Simple improvements like caulking the tub or re-grouting the tile floor will go a long way in the mind of a buyer,” says Bree Al-Rashid, an agent with Redfin, a real estate brokerage. And consider this: 42 percent of real estate professionals we survyed said the bathroom is one of the most important rooms of the home to have in good shape. Installing new bathroom fixtures will make the space look brighter and more appealing. “I tell my clients to replace anything with a handle, especially if the home has hard water, since it causes so much metal corrosion,” says Ginny Ivanoff, a real estate consultant in Carlisle, Pa. Updating the mirror and lighting will improve the sensory experience. 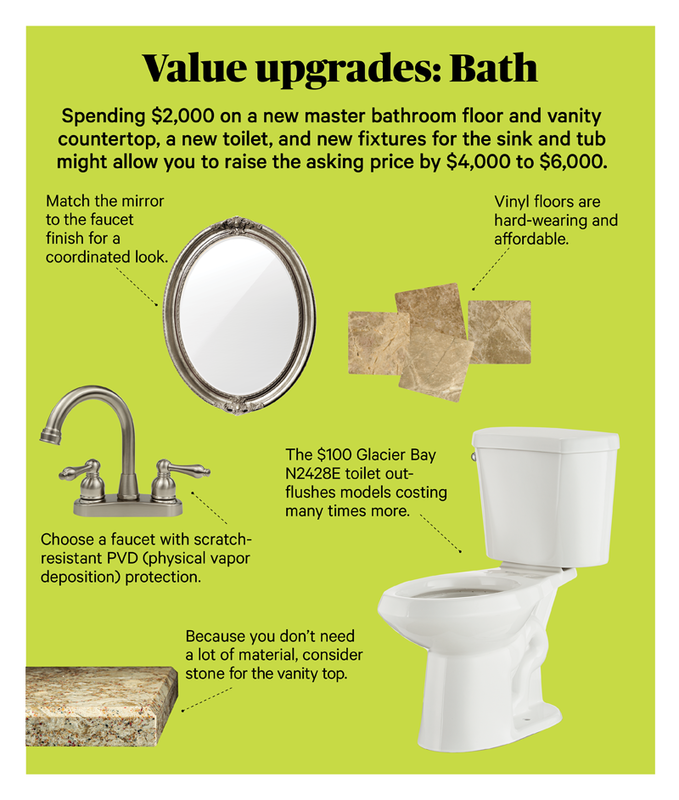 If you’re not looking to sell right away, there are several larger upgrades that shouldn’t cost a fortune, given the small dimensions of many bathrooms. For example, you might be able to add a new floor and vanity countertop for less than $1,000, especially if you use inexpensive vinyl and laminate. Adding new toilets is also a smart upgrade because it can improve the look of a home while also making it more water-efficient. We recently tested toilets to see how well they handle solid waste (using sponges and plastic balls) without leaving unsightly stains inside the bowl or creating a deafening whoosh. Click on the image for paint upgrades. As for the paint itself, if you’re getting your home ready to sell, choose a paint that does a good job of hiding old paint and leaves a fairly smooth surface; several in our interior paint Ratings meet those requirements for less than $30 per gallon. Invest in a top-quality product if you’re planning to be in the home for a while. Our tough tests, which include scrubbing the finishes with harsh abrasives, found eight winners. Because a brand’s flat, eggshell, and semigloss formulations perform similarly overall, we’ve combined the scores into one to simplify the process. You can paint the walls yourself or pay a pro about $300 per room, paint included, with added rooms costing $200, says Debbie Zimmer, a spokeswoman for the Paint Quality Institute. Click on the image for exterior updates. You wouldn’t go to a job interview without brushing your hair and putting on a crisp, clean outfit. Nor should you try to sell your home without sprucing up its exterior. Start with basic maintenance: mowing the lawn, trimming overgrown shrubs, applying a fresh layer of mulch to garden beds. As with your home’s interior, it’s also important to make minor repairs, such as replacing cracked siding boards or repointing brick walls. “Any house could probably also stand a good power washing,” adds Ginny Ivanoff. Follow with any necessary paint touch-ups, especially to the front of the building, which will get the most scrutiny. It might be worth completely repainting the entry door, provided that won’t make the rest of the facade seem tired and outdated. A top-performing semigloss exterior paint, such as Lowe’s exclusive Valspar DuraMax Semi-Gloss, $40 per gallon, provides maximum protection plus a bit of visual contrast and shine. The roof is another area to pay close attention to because prospective buyers are sure to do the same. Indeed, 31 percent of real estate professionals said the roof is one of the more important parts of the home to have in good shape. “They always, always ask how old the roof is,” says Bruce Irving. “To be able to say the roof is new signals to the buyer that this house has been cared for, plus the project is usually a lot cheaper than people realize.” That’s particularly true if you choose standard three-tab asphalt shingles, which often cost about $75 per 100 square feet; including installation, a typical reroof might cost as little as $6,000. If you’re not in a rush to sell, consider upgrading to laminated shingles, also known as architectural shingles. They can cost two to three times as much as the three-tabs but in our tests proved much stronger. Whichever type of shingle you choose, look for a product with a warranty that can be transferred to the next owner. 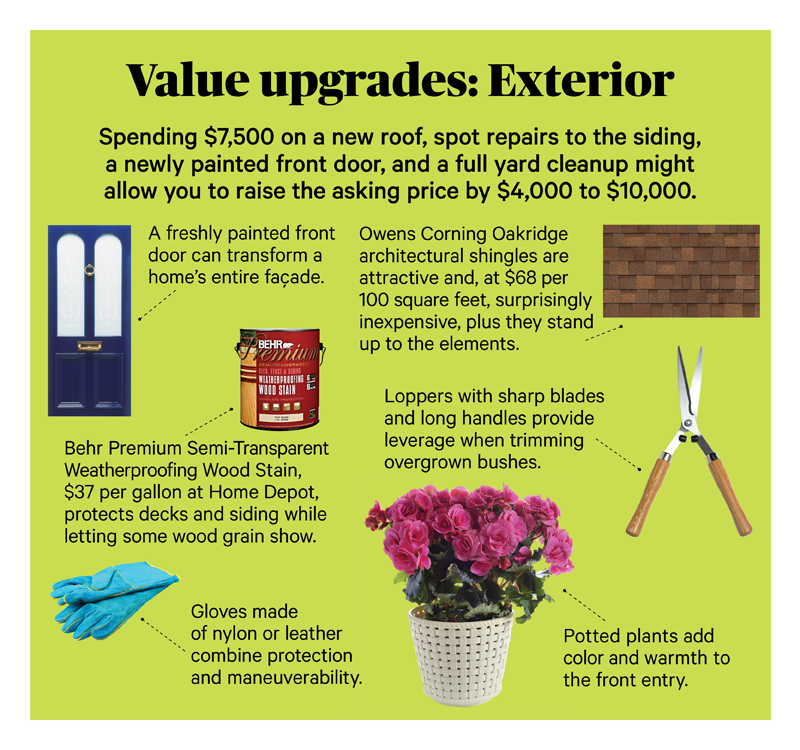 This article also appeared in the March 2015 issue of Consumer Reports magazine. View and compare all Paints ratings. View and compare all Toilets ratings.